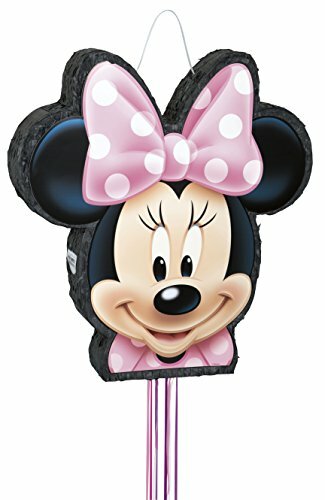 1 minnie mouse pull string pinata. Throw a girl’s birthday party to remember with this adorable Minnie Mouse Pinata. Shaped just like Minnie wearing her iconic pink polka dotted bow, this pull-string pinata is a classic game for a Minnie Mouse birthday or Minnie Mouse theme party. In a fun and safe twist on the traditional rules, players take turns tugging on each of the 12 built-in pull strings until one randomly releases the goodies inside. When not in use, this darling Minnie pinata doubles as a festive party decoration. Pinata ships flat and expands 4″ deep for easy filling.